Fahrenheit 451, Ray Bradbury’s classic work of science fiction, remains relevant in the 21st century thanks in part to the subtle symbolism tied to its characters. Each character in the novel struggles with the concept of knowledge in a different way. While some of the characters embrace knowledge and take on the responsibility of protecting it, others reject knowledge in an effort to protect themselves and their own comfort—none more so than the novel’s protagonist, who spends much of the novel attempting to remain ignorant even as he willfully seeks out knowledge in a struggle against himself. Guy Montag, a fireman, is the protagonist of Fahrenheit 451. In the universe of the novel, the traditional role of the fireman is subverted: buildings are largely made from fireproof materials, and the job of a fireman is to burn books. Instead of preserving the past, a fireman now destroys it. Montag is initially presented as a content citizen of a world where books are treated as dangerous. The famous opening line of the novel, “It was a pleasure to burn,” is written from Montag’s perspective. Montag revels in his work and is a respected member of society because of it. However, when he meets Clarisse McClellan and she asks him if he is happy, he experiences a sudden crisis, suddenly imagining that he is splitting into two people. This moment of splitting comes to define Montag. Until the end of the story, Montag indulges in the idea that he is not responsible for his own increasingly dangerous acts. He imagines that he is controlled by Faber or Beatty, that his hands move independently of his will when he steals and hides books, and that Clarisse is somehow speaking through him. Montag has been trained by society not to think or question, and he attempts to maintain his ignorance by separating his inner life from his actions. It is not until the end of the novel, when Montag attacks Beatty, that he finally accepts his active role in his own life. Mildred is Guy’s wife. Although Guy cares very deeply for her, she has evolved into a person he finds alien and horrifying. Mildred has no ambitions beyond watching television and listening to her ‛Seashell ear-thimbles,’ constantly immersed in entertainment and distraction that requires no thought or mental effort on her part. She represents society as a whole: seemingly superficially happy, deeply unhappy inside, and unable to articulate or cope with that unhappiness. Mildred’s capacity for self-reliance and introspection has been burned out of her. At the beginning of the novel, Mildred takes more than 30 pills and almost dies. Guy rescues her, and Mildred insists that it was an accident. The ‛plumbers’ who pump her stomach, however, comment that they routinely deal with ten such cases every evening, implying that this was a suicide attempt. Unlike her husband, Mildred flees from any sort of knowledge or admission of unhappiness; where her husband imagines himself splitting into two people in order to deal with the guilt that knowledge brings, Mildred buries herself in fantasy in order to maintain her ignorance. When the consequences of her husband’s rebellion destroys her home and fantasy world, Mildred has no reaction. She simply stands in the street, incapable of independent thought—much like society at large, which stands idly by as destruction looms. Captain Beatty is the most well-read and highly educated character in the book. Nevertheless, he has devoted his life to destroying books and maintaining society's ignorance. Unlike the other characters, Beatty has embraced his own guilt and chooses to utilize the knowledge that he has attained. Beatty is motivated by his own desire to return to a state of ignorance. He was once a rebel who read and learned in defiance of society, but knowledge brought him fear and doubt. He sought answers—the sort of simple, rock solid answers that could guide him to the right decisions—and instead he found questions, which led in turn to more questions. He began to feel despair and helplessness, and ultimately decided that he was wrong to seek knowledge in the first place. As a Fireman, Beatty brings the passion of the converted to his work. He despises books because they failed him, and he embraces his work because it is simple and comprehensible. He uses his knowledge in the service of ignorance. This makes him a dangerous antagonist, because unlike other truly passive and ignorant characters, Beatty is intelligent, and he uses his intelligence to keep society ignorant. A teenage girl living near Guy and Mildred, Clarisse rejects ignorance with childlike honesty and courage. Not yet broken by society, Clarisse still has a youthful curiosity about everything around her, demonstrated by her constant questioning of Guy—questioning that spurs his identity crisis. Unlike those around her, Clarisse seeks knowledge for knowledge’s sake. She does not seek knowledge to use it as a weapon like Beatty, she doesn’t seek knowledge as a cure to an internal crisis like Montag, nor does she seek knowledge as a way of saving society like the exiles do. Clarisse simply wants to know things. Her ignorance is the natural, beautiful ignorance that marks the beginning of life, and her instinctive efforts to answer questions represent the best of humanity’s instincts. The character of Clarisse offers a thread of hope that society might be saved. As long as people like Clarisse exist, Bradbury seems to imply, things can always get better. Clarisse disappears from the story very early on, but her impact is large. Not only does she push Montag closer to open rebellion, she lingers in his thoughts. The memory of Clarisse helps him organize his anger into opposition against the society that he serves. Professor Faber is an elderly man who was once a teacher of literature. He has seen society’s intellectual decline in his own lifetime. He is positioned as the polar opposite of Beatty in some ways: he despises society and believes strongly in the power of reading and independent thought, but unlike Beatty he is fearful and does not use his knowledge in any way, instead opting to hide in obscurity. When Montag forces Faber to assist him, Faber is easily intimidated into doing so, as he fears losing the little he has left. Faber represents the triumph of ignorance, which often comes in the form of blunt practicality, over intellectualism, which often comes in the form of weightless ideas with no practical application. Granger is the leader of the drifters Montag meets when he flees the city. Granger has rejected ignorance, and with it the society built on that ignorance. Granger knows that society goes through cycles of light and dark, and that they are at the tail end of a Dark Age. He has taught his followers to preserve knowledge using only their minds, with plans to rebuild society after it has destroyed itself. The old woman appears early in the story as Montag and his fellow firemen discover a cache of books in her home. 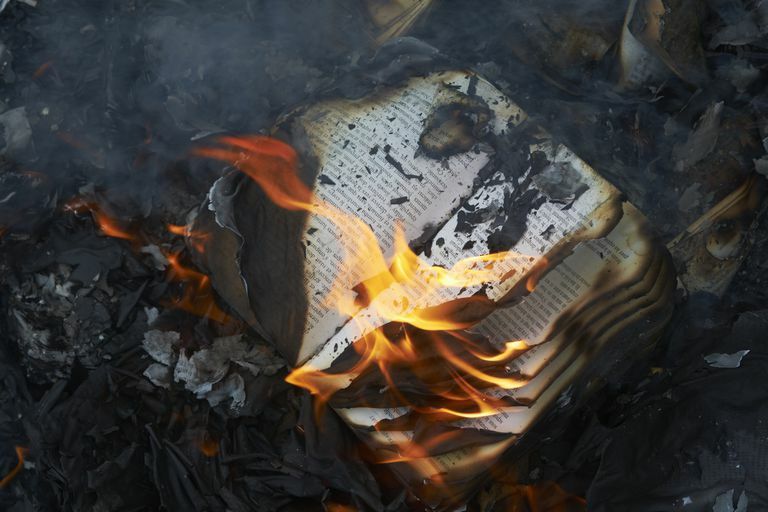 Rather than surrender her library, the old woman sets herself on fire and dies with her books. Montag steals a copy of the Bible from her home. The Old Woman’s hopeful act of defiance against the consequences of ignorance stays with Montag. He can’t help but wonder what books might contain that would inspire such an act.